Hello book friends! 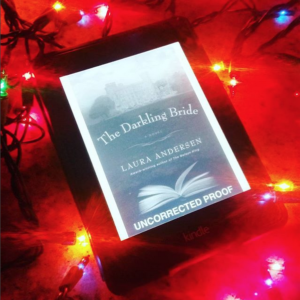 I just wanted to give a quick status update on my progress through The Darkling Bride by Laura Andersen. As I may have mentioned in a earlier post, I received an Advanced Readers Copy (ARC) of this book from the publisher, Ballantine Books, in exchange for an honest review which has an expected publication date of April 2018. I am currently just over 60% through this book. I am loving it! Originally, I went into the book thinking, historical fiction, but I have discovered it is really so much more than that. The book does weave a bit of historical fiction into what is actually more of a modern day murder mystery. The main storyline takes place in a very old (and possibly haunted) castle in the County Wicklow. Our protagonist, Carragh, is an archivist sent to the castle to archive their extensive historical library. There she finds not just books but mystery, suspense, gothic settings, a potential love match, long guarded family secrets and an unsolved murder that sees its investigation rekindled. There is so much to love about this book and I am hoping that many, many readers get to enjoy it as much as I am once it is published in the Spring!